Qute Makes the Guardian Gift Guide! News just in, the Guardian have launched this year’s Christmas Gift Guide and not one, not two, but three of our products feature in the pet section! They have selected the Mega Treat Pack for Seriously Spoilt Chickens, the Winter Warmer Pack for Rabbits and the brand new Qute Hamster and Gerbil Cage! A great choice, we think! But remember, if a Qute is at the top of your child’s Christmas list you should place your order asap as we only have a limited number available for Christmas delivery! There are only 12 days to go until the Christmas countdown begins, and that means we’ll soon be able to open the first door of our advent calendars. Hooray! Now, although having a chocolate to eat every day is brilliant, and a great way of getting you out of bed in the morning, we have our own type of advent calendar that we think you will love! For the first time ever we will be running an Omlet Online Advent Calendar, full of special offers and dazzling discounts. Every day there will be a door for you to open, with a new offer hiding behind it, and each offer will be valid for one day only. There are some great savings to be made so make sure you check it out.. We’ll give you details of how to access the calendar on 1st of December …not long to wait now! 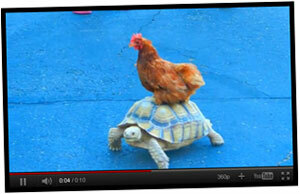 This week we spotted a post on the forum that made us look twice… A link to a video of a chicken riding a tortoise. Yes, it sounds bizarre, but take a look at the clip yourself and you’ll see it clear as day. The full sized chicken is standing on the shell of a tortoise, being carried around at quite a pace. How, or why it occurred, we do not know, but what we can say for sure is that it is quite hentertaining! Click here to watch the comedy duo in action! Have you seen something similar going on in your own back garden? Then be sure to send us a photo or video! Click on image to watch this funny clip!